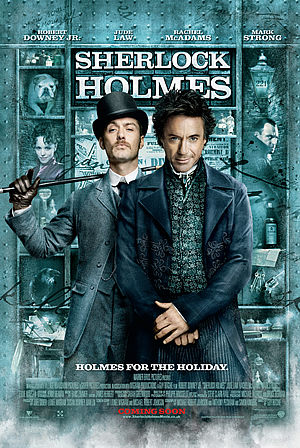 Synopsis: Robert Downey Jr. reprises his role as the world’s most famous detective, Sherlock Holmes, and Jude Law returns as his formidable colleague, Dr. Watson, in “Sherlock Holmes: A Game of Shadows.” Sherlock Holmes has always been the smartest man in the room…until now. 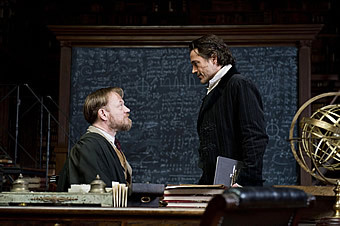 There is a new criminal mastermind at large—Professor Moriarty (Jared Harris)—and not only is he Holmes’ intellectual equal, but his capacity for evil, coupled with a complete lack of conscience, may actually give him an advantage over the renowned detective. When the Crown Prince of Austria is found dead, the evidence, as construed by Inspector Lestrade (Eddie Marsan), points to suicide. But Sherlock Holmes deduces that the prince has been the victim of murder—a murder that is only one piece of a larger and much more portentous puzzle, designed by one Professor Moriarty. 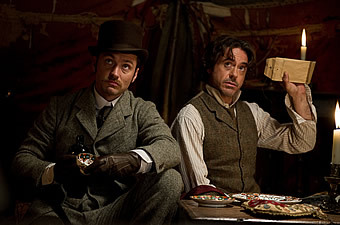 Mixing business with pleasure, Holmes tracks the clues to an underground gentlemen’s club, where he and his brother, Mycroft Holmes (Stephen Fry) are toasting Dr. Watson on his last night of bachelorhood. 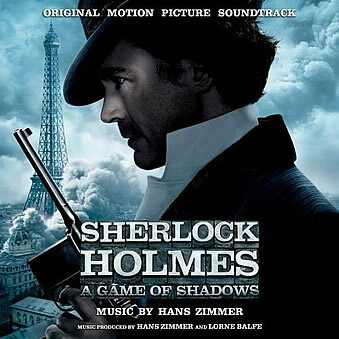 It is there that Holmes encounters Sim (Noomi Rapace), a Gypsy fortune teller, who sees more than she is telling and whose unwitting involvement in the prince’s murder makes her the killer’s next target. Holmes barely manages to save her life and, in return, she reluctantly agrees to help him. 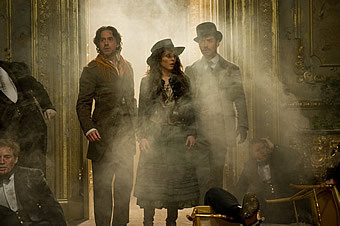 The investigation becomes ever more dangerous as it leads Holmes, Watson and Sim across the continent, from England to France to Germany and finally to Switzerland. But the cunning Moriarty is always one step ahead as he spins a web of death and destruction—all part of a greater plan that, if he succeeds, will change the course of history. Just two movies in and there already seem to be a sort of weariness about the Sherlock Holmes franchise helmed by director Guy Ritchie. 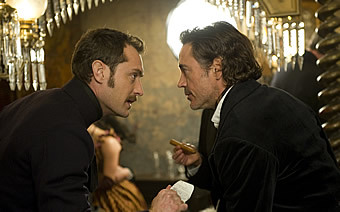 Led by Robert Downey Jr. and Jude Law as the eponymous Holmes and his sidekick Watson, the sequel named "Sherlock Holmes: A Game of Shadows" completes an underwhelming transformation from cleverly kinetic and terrifically droll into a disappointingly stale and underwritten hodgepodge of loud explosions and cross-dressing humour. The chemistry between the leads, including the returning Rachel McAdams, is still there and at times holds the flimsy plotting together through mere star power but the results still vary tremendously during the span of its runtime – good scenes recalling the best of its past glories mired together with scenes searching for a decent punch-line. 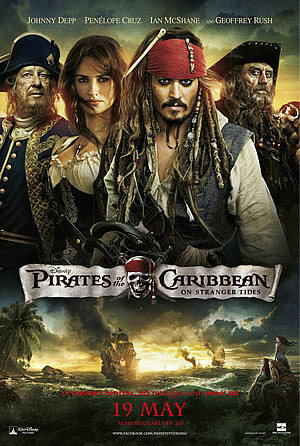 Again, more than anything, this film works only on the level of a star-driven vehicle Hollywood product. 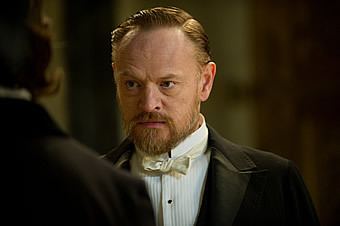 Jared Harris of “Mad Men” fame joins in as Holmes’ arch nemesis, Professor Moriaty, the detective’s fiendish and formidable intellectual peer. Harris matches Downey Jr.’s presence rather well here and creates a tension that proves to be the only compelling aspect of the film. His introduction immediately elevates the material and raises the stakes of the film, which it then proceeds to regrettably minify from the height of its first act. The film also commits itself to further egregiously waste its array of talented performers by roping in a game Noomi Rapace (“The Girl with the Dragon Tattoo”), her star still warm from the mega popular Stieg Larsson franchise back in Sweden. However, the film has absolutely no clue with what to do with her. With no real purpose other than being a foil to the bickering couple, she follows the duo on their quest to stop Moriaty from enacting his dastardly plans. 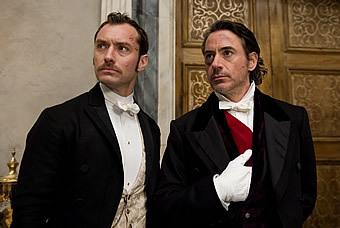 And supposing that any actor playing off an eccentric and distinctive performer of Downey Jr.’s calibre will be overshadowed, the sequel also serves to highlight how Ritchie and Law still have no idea how to imbue Watson with anything resembling actual personality. 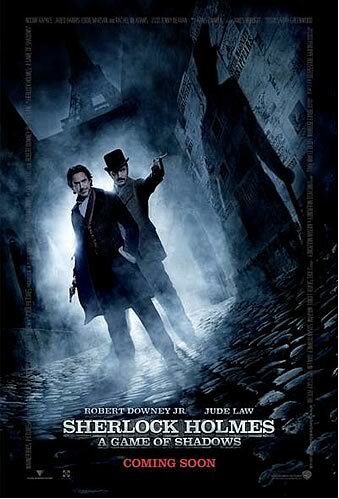 There is perhaps more than a touch of Barry Sonnenfield’s “Wild Wild West” style-over-substance syndrome here, 1999’s revisionist steampunk action comedy set in the 19th century with Will Smith and Kevin Kline in a similar buddy cop fashion as Downey Jr. and Law. What goes wrong there finds its way here – the messy and uneven direction of tone and pacing leading into absurd story threads that string together a spate visual effects together with nothing compelling in between. Ritchie brings his usual stylistic flourishes here with slow-motion belligerence, energetic set-pieces and his unfortunate career-long compulsion to immediately lighten up any moments of intensity but the sequel loses the special quality of the first film, which at least had the pleasure of discovering a revisionist universe of an iconic character. Ritchie’s pedigreed inventiveness is lacking here in how little originality the film has within its two-hour runtime by flogging a dead horse again and again – when it finds a good gag or scene, it milks it dry. The result is a film that is lifeless and uninvolving. It almost feels as if Ritchie lets the set-pieces and the actors direct the film for him instead of pulling up the reins and crafting a cogent narrative.